Sea Level Traverse runs all year round, with sessions in the winter maintaining the aim of exploring the coastline but staying dry. WHAT IS SEA LEVEL TRAVERSING? 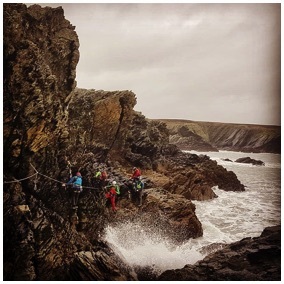 Sea Level Traversing is a journey along the intertidal zone and a great alternative to coasteering. We use ropes to set up ‘via ferrata’ style clip lines along trickier sections and use zip wires and tyrolean traverses to cross the wide zawns. By using these clip lines we can set up exciting challenges higher above the sea than is possible on a coasteering session. This means that we can be more flexible on conditions. It is often possible to safely Sea Level Traverse when it is not possible to go swimming in the sea on a coasteering session. 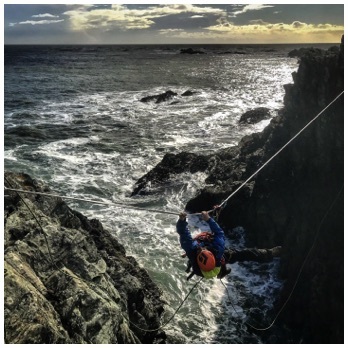 So if you like the challenge of rock climbing and the adrenaline of a zip wire, the combination will provide a great journey for you along the coastline.